The Huron Pines mission to protect the Au Sable waters and the forest around drew this Grayling native back. This guest post is part of the Traverse Magazine series “For Land and Water.” Subscribe for more about environmental preservation efforts in our communities. They say you can’t go home again, but they weren’t raised on the Au Sable River. I grew up in Grayling, moved away for college and a career, and for the last decade, lived downstate in a house with a white picket fence. One day I convinced my husband that we should make a list of the top five things we wanted out of life. If money were no object, we asked ourselves, who would we become and where would we end up? At the top of the page were occupations and locations, and we both shared the same goals, to apply our talent and energy to work that made a positive impact, and to live on the water. Years went by. I earned a promotion, we started a family, we settled in, but the list never left me. I looked at waterfront properties for sale and explored open positions, searching for the kinds of jobs I could feel proud of, where the hours I invested translated to positive change for the people and places around me; where I didn’t need to worry about work-life balance, because they would both be in service of my passions. Then, by a stroke of luck, a neighbor introduced me to Huron Pines, a natural resources protection nonprofit, and the more I learned about their work, the more the list came back to life. With a mission to protect the Great Lakes by conserving the forests, lakes and streams of Northeast Michigan, the connection to my personal values was clear. 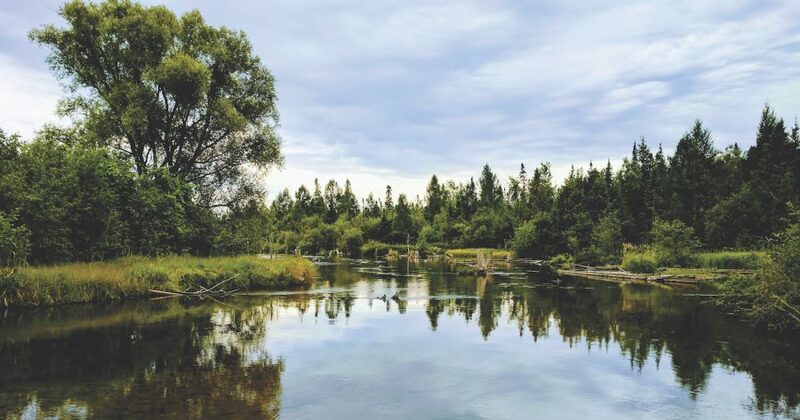 Growing up in Grayling with a river known as “the Holy Waters” running through my backyard, I found a sense of peace in the forest and freshwater that I didn’t fully appreciate until I moved away, where easy access to natural resources was harder to come by. My desire to live near the water, to return to a place with an abundance of natural resources, was all because I was lucky enough to grow up in a town where I had access to rivers, lakes, trails and forests that were well cared for. I want to help more people—including my own sons—grow up in places like that. The mission drew me in, and the staff convinced me that Huron Pines was the right fit—a mix of ecologists, biologists and educators dedicated to doing good work that creates a connection between quality of life and conservation. I was struck that some of the staff aren’t even from Michigan, but fell in love and stayed to protect the places they’ve come to call home. They are passionate about their work, from river restoration projects that help fish populations flourish to land management programs that help property owners improve water quality and support wildlife habitat by growing native plants and treating invasive species. They do this work because it matters to them, and because they want these magical places to matter to everyone. The more that people fall in love with nature and Northern Michigan, the more likely it is that these places will be cared for and protected for years to come. I fell in love with Northern Michigan over 30 years ago and now I’m raising my own family here, in a house on the river, in the hopes that my sons will develop a passion for preserving these wild places, too. Colby Chilcote is Marketing Director at Huron Pines. Learn more about Huron Pines at huronpines.org and follow Colby on Twitter @ColbyChilcote.